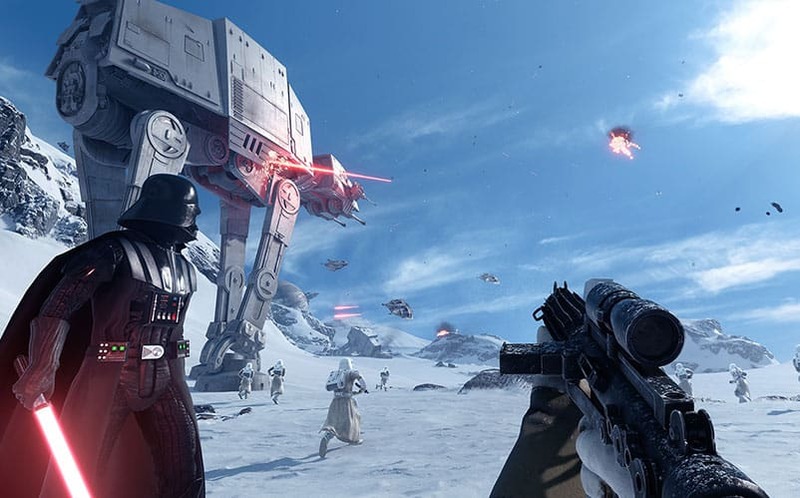 Star Wars Battlefront Beta Coming in October to All Platforms | Nerd Much? EA has announced a Star Wars Battlefront beta that will be available for all platforms in early October. Players who partake in the Star Wars Battlefront multiplayer beta will be able to battle in the Walker Assault on Hoth, which will pit 40 players in a Rebels vs. Empire battle on the icy world. This battle will also allow players to play as Darth Vader and/or Luke Skywalker. The beta will have a second map available, Survival Mission Tatooine, which will give players our first look at the newly introduced planet. In this mode, two players fight against waves of Imperial forces. The beta will also introduce an entirely new mode we haven’t yet heard about called Drop Zone, which EA will shed more light on in the coming weeks. According to EA, the beta will also feature the Battlefront Companion for the strategy card game called Base Command, which allows players to unlock weapons and other things (probably costumes). The companion will also track user stats and progression, manage loadouts and connect with their friends who also play the game. Stats and progress will not be carried over to the full retail release. Hopefully, this beta will help EA work out the server kinks before the game is released on November 17 for the PS4, Xbox One and PC, although EA has had multiplayer betas for other games that still resulted in botched launches (looking at you Battlefield 4). Stay tuned to Nerd Much for more about the Battlefront beta when we receive an official date. We’ll see you out there.